BEIJING - China and Japan agreed to seek better ties as the Japanese foreign minister visited China, the first in his official capacity, amid maritime disputes. During their meeting on Monday morning, Foreign Minister Yang Jiechi and his Japanese counterpart Takeaki Matsumoto reiterated the importance of bilateral relations. "It is meaningful to exchange views with you at the present time," Matsumoto told Yang, adding "trust and stability" are important for the two countries. Also on Monday, the Foreign Ministry said it had lodged a protest to Tokyo about Japanese fishing boats operating in waters around China's Diaoyu Islands, in the East China Sea, on Sunday. "China has lodged solemn representations with the Japanese side, and demands Japan immediately withdraw the fishing boats from the area," ministry spokesman Hong Lei said. "The Diaoyu Islands and adjacent islets are Chinese territory since ancient times, and China has indisputable sovereignty over them," he said. "Any actions taken by Japan in the seas around the Diaoyu Islands are illegal and invalid." Hong said that the Japanese fishing boats had left the area. The Tokyo-based Yomiuri Shimbun newspaper said on Sunday that a Chinese fishery administration vessel appeared in the area and stayed there for four hours. 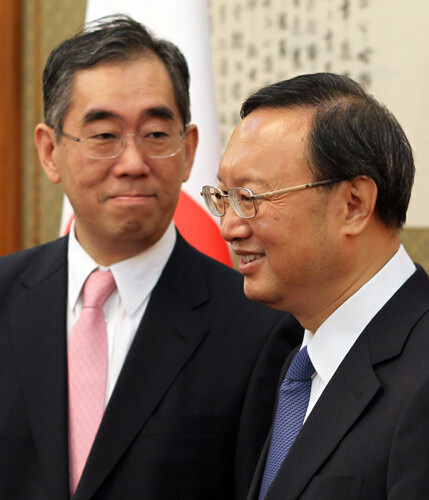 Hidenobu Sobashima, deputy press secretary at the Japanese Foreign Ministry, said the two foreign ministers touched upon maritime issues, including the Diaoyu Islands, against "a general background". "They did not go into the specifics of the incident (on Sunday), while both sides made their stance clear," he said. He also said that Matsumoto briefed Yang on the US-Japan security talks held in Washington on June 21. The US and Japan reportedly agreed on deepening strategic cooperation, an agreement believed to be partly targeted at the Chinese military. Yang expressed concern at this development, Xinhua reported. During the meeting with Yang, the Japanese foreign minister also asked China to lift restrictions on Japanese agricultural products imposed after the nuclear crisis following the March earthquake and tsunami, Sobashima said. In addition, the two ministers touched upon the Korean Peninsula situation, the South China Sea issue as well as joint exploration by China and Japan of oil resources in the East China Sea, he said. Japan's Sankei Shimbun newspaper reported that Japanese Prime Minister Naoto Kan wants to visit China in October to attend memorial activities marking the centenary of China's 1911 Revolution, which overthrew the Qing Dynasty (1644-1911) and ended China's last feudal society. Premier Wen Jiabao invited Kan to visit China when he visited Japan in May. But Japanese opposition parties did not support the idea and hoped instead that Kan will step down in August as expected, the newspaper report said. Matsumoto arrived in Beijing on Sunday night on his first visit to China after taking office in March. He is also the first Japanese Cabinet member to visit China since a major maritime row last year when a Chinese trawler collided with Japanese coastguard ships in September in waters off the Diaoyu Islands. Beijing froze diplomatic meetings with Tokyo in protest until Japan released the captain of the Chinese boat. Lian Degui, deputy director of the Japanese Studies Center at the Shanghai Institutes for International Studies, said Matsumoto's visit failed to achieve tangible results due to the unstable political situation in Japan. "Although it is not sure whether Kan will resign in August as he claimed, his Cabinet is very weak," Lian said. Kan, fighting off challenges to his leadership by the opposition and members of his own party, was focusing on diplomacy and he hoped Matsumoto's China visit would provide a boost for his administration, Lian said. Zhou Yongsheng, a professor of Japanese studies at the China Foreign Affairs University, also said that the visit had only a limited impact on relations. Beijing is unlikely to loosen restrictions on Japanese agricultural imports until the nuclear crisis is fully resolved, Zhou said. Wang Chenyan contributed to this story.